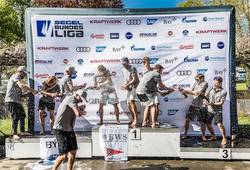 J/News Articles: NRV Leads German J/70 Sailing League..Again! NRV Leads German J/70 Sailing League..Again! 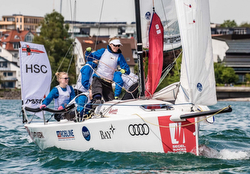 (Friedrichshafen, Germany)- Last weekend, the German J/70 Sailing League celebrated the start of its sixth season, with the opener taking place in Friedrichshafen (Lake Constance). A total of 36 clubs with 144 sailors from all over Germany are participating. Of course, the reigning German champion from Hamburg, the North German Regatta Club (NRV), was also present. "We continued to prepare extensively for the new season, we even trained a few weeks ago with ice and snow on the Alster Lake in downtown Hamburg! Come what may, the guys are hot and want to play again this year at the top level,” said Klaus Lahme, team manager of the NRV. Schwall’s assessment was spot on. Sailing on Lake Constance was challenging, as the winds remained light for most of the weekend. In the end, the reigning German Champion, the Norddeutsche Regatta Verein (NRV) from Hamburg, won the kick-off event in Friedrichshafen. The three-time German champion, the NRV, showed impressively this weekend that he has not forgotten sailing in the winter break. "We feel great after this victory at the season opener. We have linked our performance directly to last year's. There were three great days on Lake Constance. Our goal for the season is clearly title defense,” said a happy helmsman- Florian Haufe. Together with his crew David Heitzig, Dorian Heitzig and Miklas Meyer, the northern team rocked Lake Constance. Also strong and just one point behind the NRV, the Bavarian Yacht Club team took second place. Behind them in third place was the Water Sports Club Hemelingen from Bremen. In just under six weeks (8th to 10th June 2018), the next event will take place in Tutzing, on Lake Starnberg. 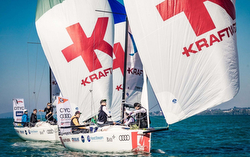 German J/70 Sailing League highlights video from Friedrichshafen For more German J/70 Sailing League information Add to Flipboard Magazine. REACH AROUND Crowned J/70 N.A. Champion! J/Doublehanded Crews Sweep North Sea Regatta! Family sailing J/70s off St Petersburg! J/46 Rendezvous @ Camden Classic Cup! Successful Spring Tune-Up for J/121 Speedsters! ENFANT TERRIBLE- ADRIA FERRIES Two-Peats! J/70 TANGAROA Wins Yachting Cup Overall! Ingham Crowned J/24 NA Champ By A Nose! Fun J/Stop Regatta on San Francisco Bay! Creating Opportunities for Women Sailing! Hungarian Women's J/24 Team Wins Ladies Cup! Fast Newport to Ensenada Race! J/121 Offshore Speedster Spring Tune-Up! The J/80 Regatta “Triple Play” Announcement!